Line a 9X9-inch square baking pan with aluminum foil and set aside. Do not spray. In a medium bowl (or in the bowl of a stand mixer) combine the butter, granulated sugar, and light brown sugar and beat on medium speed until light and fluffy. Mix in the vanilla, salt, and heavy cream. Add the flour and mix until just combined. Fold in 1/2 cup of the chocolate chips. Set aside. In a large pot (like a soup pot) combine the brown sugar, butter, salt, and heavy cream. Stir over medium heat until the butter is melted and the brown sugar is dissolved. The mixture should be smooth and combined. Remove from the heat and stir in the vanilla. Gradually stir in the powdered sugar, 1 cup at a time, until the mixture is smooth and thick. You will know when you have enough powdered sugar when the fudge forms itself into a ball and pulls away from the sides of the pot. Let this mixture cool completely before proceeding so the chocolate chips do not melt when combined. Add the fudge base to the cookie dough bowl and stir to combine. Spread the fudge into the prepared baking pan and press into an even layer. Sprinkle the remaining 1/4 chocolate chips on top of the fudge and lightly press them into the batter. Chill until set, about 4 hours, before cutting into pieces. When you're ready to cut just lift out the fudge by the overhang of the tin foil and the cut into squares. 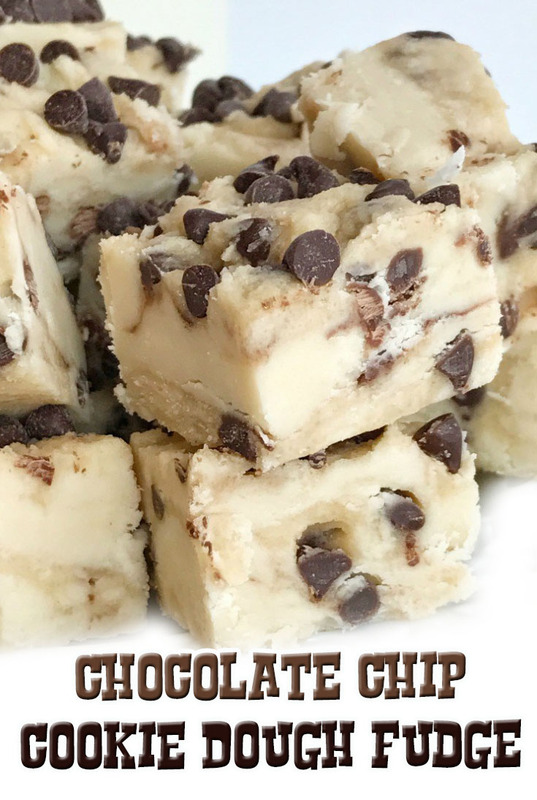 This fudge softens as it sits at room temperature. I prefer to keep it in the fridge.